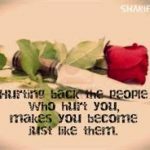 Mostly people who get hurt, their instant reaction is let me hurt other people but then, How are you different from them….How will this unpleasant cycle end!! Forgive yourself and forgive others…Peace within is most important! !